Those holding both a medical and a radiological qualification are eligible to become members of the Faculty. In addition, the Board of the Faculty may, by unanimous vote admit to membership persons deemed suitable by the Board. Members of the Faculty are entitled to full participation at functions of the Faculty. Before being allowed to use the title of Fellow of the Faculty of Radiologists of the Royal College of Surgeons in Ireland (FFR RCSI), successful candidates in the Final Examination for the Fellowship must be formally admitted to the Fellowship. Those who are not already Members of the Royal College of Radiologists must become Members before admission can occur. All successful candidates are required to pay the Fellowship fee. This is paid once only unlike the membership subscription which is paid annually. Admission Ceremonies are held twice a year, normally in June and December. In order to preserve the entitlement to use the letters FFR after their names those who have been admitted to the Fellowship must maintain good standing with the Faculty of Radiologists by continued payment of the annual membership subscription. Honorary Fellows People who are outstanding in the field of radiology or an allied science may be recommended to the President of the College for Honorary Fellowship. There are a limited number of these Fellowships awarded. Only by members or ex-members of the Board can nominate a potential Honorary Fellow, and the candidate must be known professionally by the proposer. Proposals are considered by the Board of the Faculty which must submit a unanimous recommendation thereon to the President of the College. Fellows Admitted Ad Eundem Persons holding Fellowships of other Faculties or Colleges or who hold equivalent qualifications recognised by the Council and who are in the bona fide practice of their speciality in Ireland with the rank of consultant, may on the unanimous recommendation of the Board of the Faculty be considered by the Council for admission to the Fellowship of the Faculty Ad Eundem. The ground of recommendation for this mode of admission to the Fellowship shall be distinction in Radiology or in a science related thereto. For the purpose of admission to the Fellowship by this mode, the Council resolved that candidates shall: Hold at the date of application, a post ranking as a consultant in a recognised hospital in Ireland and have held this post or equivalent posts for a continuous period or continuous periods of not less than two years prior to the date of application. Applications for election to the Fellowship Ad Eundem having obtained the unanimous recommendation of the Board of the Faculty shall be referred to the Council. It was resolved by the Council that election to the Fellowship of a Faculty Ad Eundem shall be a restricted privilege. 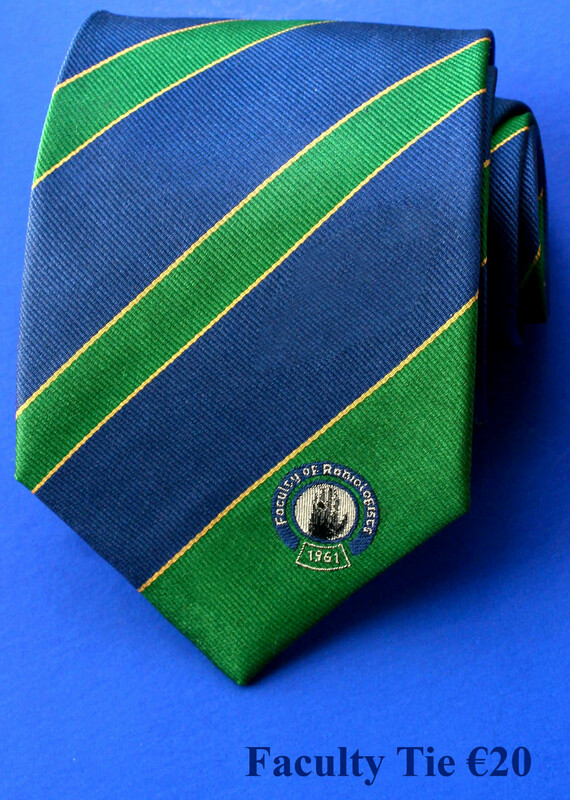 Fellows’ Ties Ties are now available for purchase exclusively by Fellows of the Faculty of Radiologists (FFRRCSI). The ties are 100% silk, and are in the Faculty colours with the logo discreetly visible on the front, and FFRRCSI embroidered on the reverse. The ties are available from the Faculty office for €20. We will shortly have a Faculty scarf available for the female Fellows to purchase.